Two problems came together in my home veggie garden last weekend. One, the area in the back of the garden we expanded into two years ago is still not developed; all we’ve done is put down cardboard in anticipation of some sheet-composting action happening this fall. 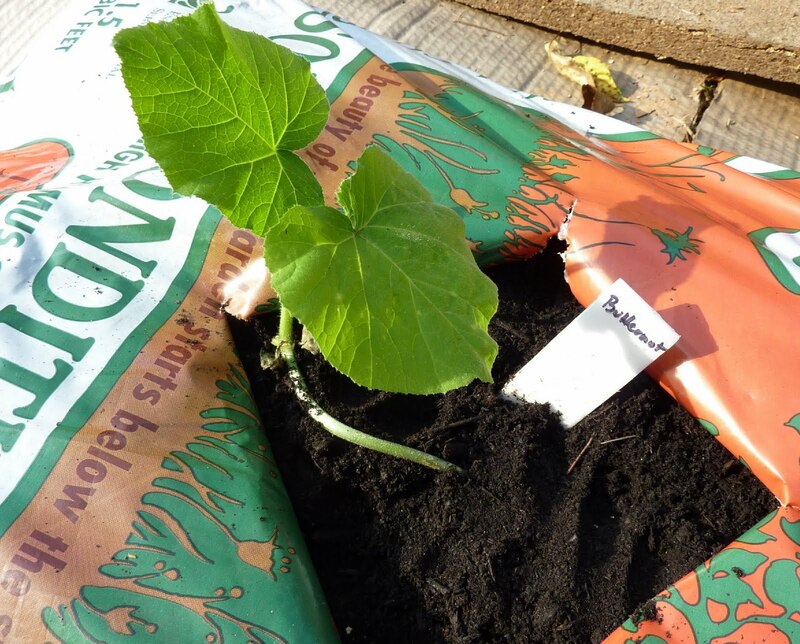 Two, I had extra winter squash seedlings, over-enthusiastically grown for the demo garden where there’s no place for them. Solution (I hope): bought four bags of Leafgro, laid them out well-spaced on top of the cardboard, slit holes in each, and planted the seedlings. I don’t have any row cover or other insect protection on them, but I’m hoping they’ll survive and serve the dual purpose of providing squash and shading out a few of the weeds until I can get more layering of materials back there. And the Leafgro can just be dumped in place at season’s end. Keep us posted. 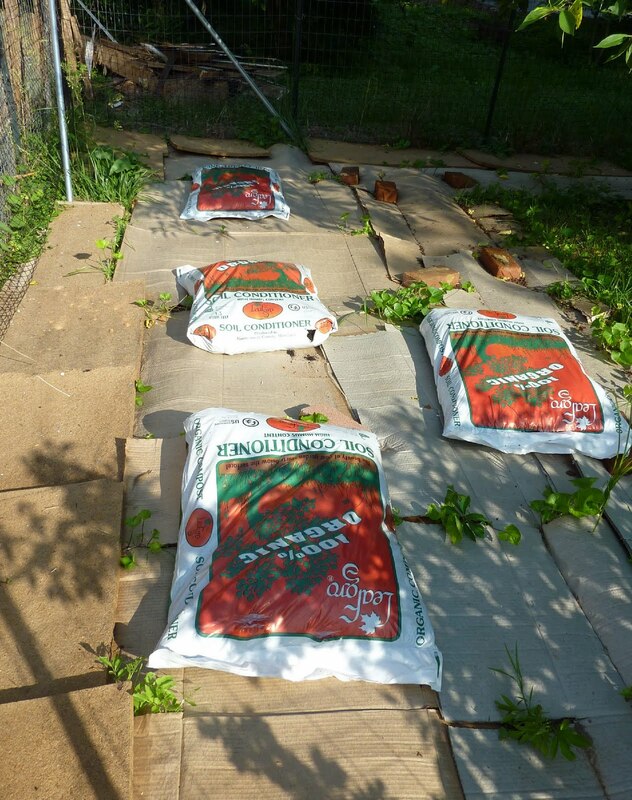 Years ago I saw an Internet photo of a tomato growing similarly, in a bag of topsoil, not Leafgro. Three cheers for determined gardeners! I'm hoping the Leafgro won't be too “strong” but so far the plants look very happy. Erica, my 6 raised plots were 100% leafgrow last year and everything grew awesome. Then the squash bugs and squash vine borers came and destroyed much of everything but that's beside the point 😉 Great idea! Great to know, Alice! Well, aside from the bugs. my winter squash vines (butternut variety, from Johnny's) never have problems with vine borers, or much else either. i definitely have vine borers in my yard, they get at the summer squashes and all, but they leave the winter squash vines alone. this may be because these vines are thin and tough, not fleshy like other cucurbits. i did have one fruit with a vine borer attempting to get into it but that is all. hopefully you will have no problems, good luck! Grow a plant in a bag with holes in always a good idea when you don't have a pot or as temporary solution. I did it 30 years ago with a small tomatoes plant…..
Julie: butternut squash is in the Cucurbita moschata species, which has little vine borer problems due to solid stems. Other Cucurbita species, even winter squash/pumpkins, have problems because their stems are softer. I've got some of each.